Carte De La Californie et Des Pays Nord-Ouest separes de L'Asie par le Detroit d'Anian, extraite de deux cartes publiees au commencement de 17e Siecle. A very interesting 1772 map of the western part of North America by Vaugondy. Includes two contrasting maps, both drawn from larger 17th century maps by Visscher, covering from Cabo san Lucas northward along Baja California to modern day Alaska and the Arctic. The larger map lists many place names, both factual and fictional, along the California coast. These include the Bay of San Miguel (San Diego), Bay de Feugos, C. Mendocino, Costa Brava, and others. Inland details include a number of river systems extending northwards from the Bay of California, the Sierra Nevada Mountains, and the Kingdoms of Tontoneteac Regnum, Tolm Regnum, Albion, Quivira Regnum and Anian Regnum. Many of these lands are mythical. Anian, for example, near modern day Alaska, was first mentioned in the journals of Marco Polo and was first noted on maps by the Venetian Cartographer Bolognini Zaltieri in 1561. Later the term was popularized in a John Donne poem, 'Anyan if I go west by the North-West passage.' 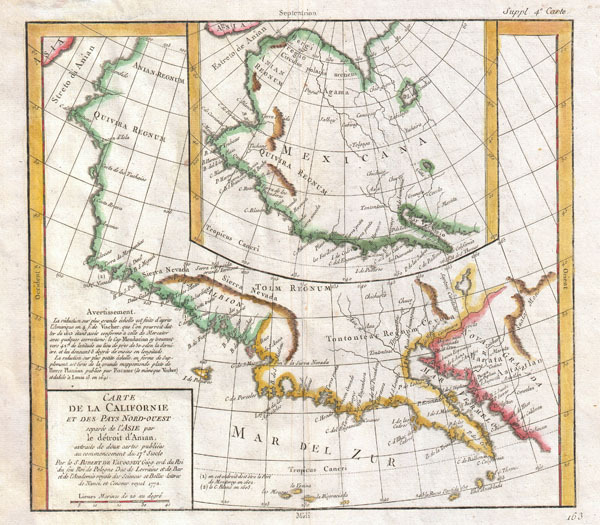 In the 18th century, it was interpreted as the Bering Strait by cartographers, successfully transitioning it from the realms of fiction to cartography. Anian presupposed the existence of a Northwest Passage and, as such, was entirely mythical, though the lands that are now Alaska long bore that name. Just south of Anian Regum is the kingdom of Quivira. Quivira was supposedly an ancient city of gold located somewhere in North America. The conquistador Coronado spent years searching for it only, some say, to arrive and find it to be little more than an American Indian wigwam town. The smaller of the two maps, derived from the Visscher and Pierre Plantius's map of 1641, bears a considerably greater resemblance to actuality. Includes many actual destinations along the coast including the Cape of San Francisco. An entrance through the 'Estreto de Anian' seems to lead to an Arctic Sea, thus suggesting a Northwest Passage. This map also labels both Anian and Quivira, even going so far as to note the city of Quivira, capital of the great mythical kingdom. This map is part of the 10 map series prepared by Vaugondy for the Supplement to Diderot's Encyclopédie, of which this is plate 4. This seminal map series, exploring the mapping of North American and specifically the Northwest Passage was one of the first studies in comparative cartography. Pedley, Mary Sponberg. Bel et Utile: The Work of the Robert de Vaugondy Family of Mapmakers. 473. Falk, Marvin W., Alaskan Maps: A Cartobibliography of Alaska to 1900, #1772-3. Wagner, Henry R., The Cartography of the Northwest Coast of America to the Year 1800,, 632. Wheat, C., The Mapping of the Transmississippi West, 1540-1861, 159. Phillips, P.L. (Atlases) 1195.4.